MRI Zone Signs Called for by the "White Paper on MR Safety and MR Safe Practice Guidelines" from the American College of Radiology, these signs provide visible safeguards and fail-safe boundaries to help protect patients, attending health care professionals, and anyone else who occasionally enters the magnetic field of MR scanners (such as housekeeping or security personnel). 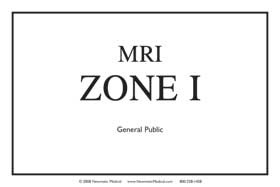 MRI Zone signs are available for each of the four MR zones, and are designed to comply with the OSHA standards for safety. Signs are 8” x 12”, constructed of 1mm PVC with double sided high-tack tape pre-positioned for easy hanging.